Bursting with contrasting textures, fragrances, and flavours, mohinga is a Burmese catfish chowder served over rice vermicelli. 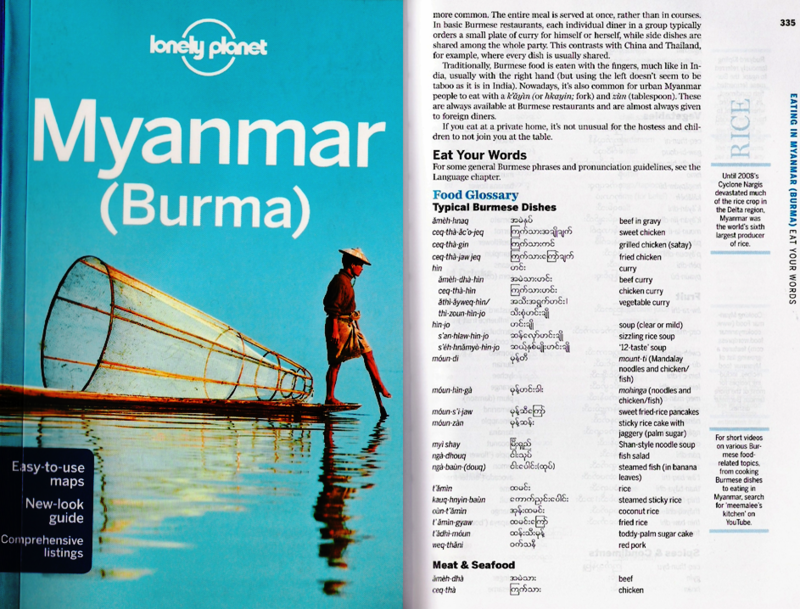 It's the breakfast of choice wherever you go in Burma, and considered our national dish. As soon as we're back in Yangon, my family and I will devour bowl after bowl of mohinga, brought home in huge metal tiffin carriers from the nearest street vendor, or eaten in situ at our favourite stall. Heaped with crispy split-peas, slices of soft duck egg, bouncy fishcake, and fresh feathery coriander leaves, with extra fish sauce and lime to squeeze on the side, it's hard to know when to stop, and for many, their love for mohinga borders on obsession. 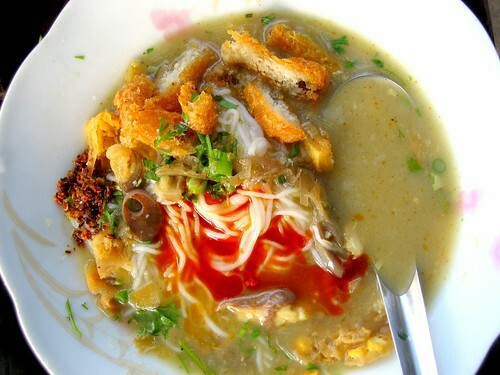 Mohinga is usually made with small river catfish known in Burmese as nga gyi, nga ku or nga yunt which I believe are related to the Pangas catfish. While you can't get the same fish in the West, I've found that a combination of tinned mackerel and sardines can successfully replicate the flavour of authentic mohinga. My father said, in slightly offensive astonishment, that this tastes "just like the real deal". 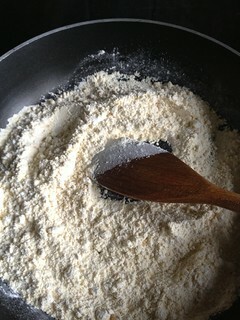 Toast the gram flour and rice flour by tossing in a dry frying-pan on a medium-high heat for 5-6 minutes till fragrant. Watch like a hawk and keep moving the pan, since it can catch and turn black in seconds. Leave to cool and then sieve the toasted flours. 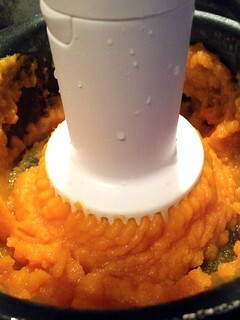 Whisk the sieved flours with 500ml water in a bowl or jug till smooth. Set this flour solution to one side. Now make the spice paste - blitz the garlic, ginger, lemongrass and coriander stems in a blender or food processor until it forms a purée. 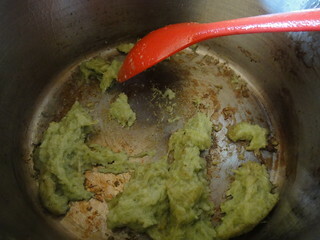 Heat the oil in a stockpot on medium-high and add the purée and the rest of the spices. Fry for 3-4 minutes till fragrant. Now add the fish as well as the oil and brine from the tins to the stockpot and mash them with a masher or a fork till smooth. 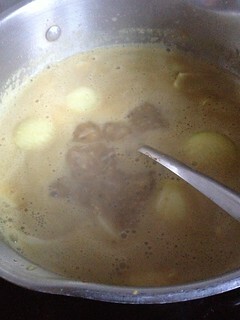 Stir to combine with the spice paste and then add the flour solution you made earlier as well as the stock. 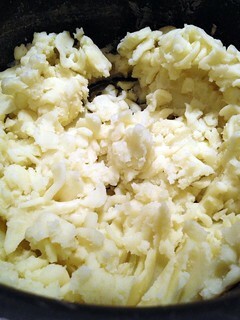 Bring to the boil, turn the heat down to medium and simmer vigorously for 30 minutes. Now add the quartered onions, the banana blossom if using and 2 litres of water, turn the heat down to medium-low and simmer for 2 more hours, stirring from time to time. Meanwhile, put the noodles into a heatproof bowl, generously cover with just-boiled water, untangle with a fork and then leave to soak for 15 minutes. Drain the noodles into a colander and rinse them thoroughly with cold running water. 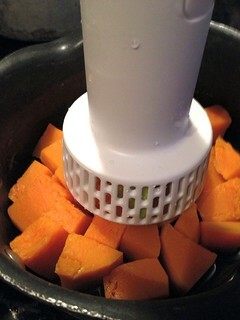 Leave the colander in the sink to allow any residual water to keep draining. 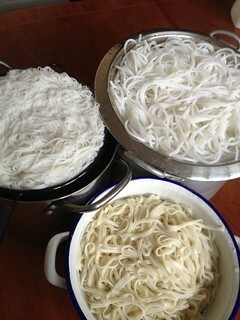 The Burmese don't like mushy or starchy noodles and this process gives the best result. Just before you're ready to serve, heat 2 tablespoons oil in a frying-pan on medium, add the fishcake and fry for 5 minutes till golden. Set to one side. 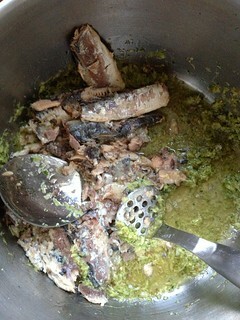 When you're ready to serve, stir the fish sauce into the stockpot of broth. Now divide the noodles amongst pasta plates (should be about a handful in each), and ladle the hot soup on top (which will reheat the noodles). Garnish each dish with fishcake, chunks of split pea cracker, egg and coriander leaves and serve with lime wedges, fish sauce and chilli and garlic oil on the side. As for utensils, ideally you should use metal Chinese spoons as you can see in all the photos and the video. 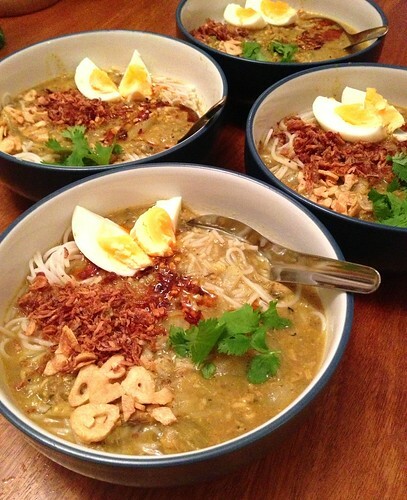 We actually call them mohinga zun which means "mohinga spoons" in Burmese. 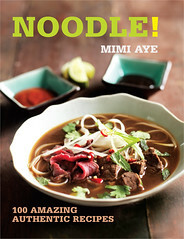 NOTE: Mohinga should be made with the stem of the banana plant, but this isn't available in the West as far as I know. A good substitute is fresh shredded banana blossom - you can buy whole flowers/buds and prepare it yourself (just the white part) or buy ready-sliced in packets in Vietnamese supermarkets where it's known as Bắp Chuối. 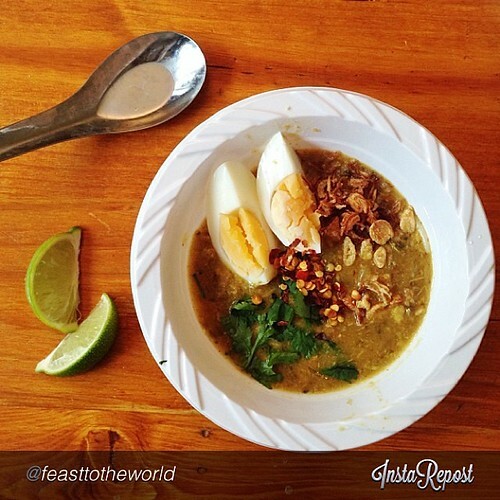 Here's a good review of where to eat mohinga in Yangon, by the London Review of Breakfasts. I don't know much about Ina Garten aka the Barefoot Contessa, but I caught a British-themed episode of her cookery show where she made "bangers and mash" using an electric blender to make her mashed potato. As any fule kno, this will result in an abysmal, gluey slop similar to wallpaper paste, rather than the glorious mash that we know and love (although I have been assured that Americans of a certain generation prefer their mashed potatoes made that way). 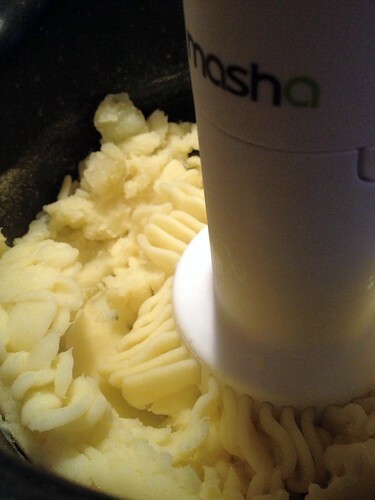 No, there's no substitute for a bit of old-fashioned elbow grease - or at least that's what I thought until I came across something called a Masha on Big Spud's excellent blog. As I'm weaning my baby daughter, I was up for anything that might make life a bit easier, so I was pleased to be sent one too. 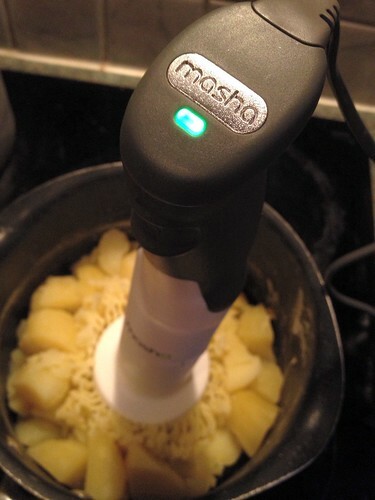 The Masha is the size of a stick blender but a little lighter. All the moving parts are made of plastic, which I like very much as blades seem to be drawn to me (or vice versa). 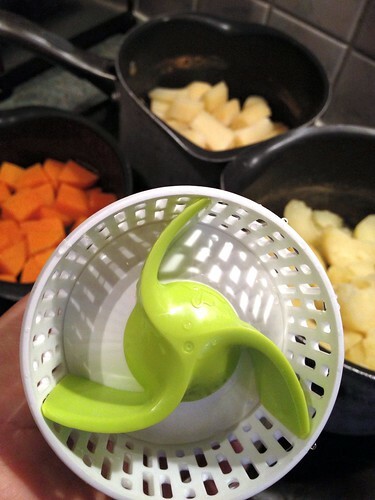 You just click the green part into the white part, place it over the veg (or fruit) to be mashed, press a button and lower the Masha into the veg repeatedly. That green thing is the "blade"
The idea is that the green "propellor" part pushes the veg into the white "sieve" so the tool extrudes the veg rather than blends it, which is how wallpaper paste is avoided. 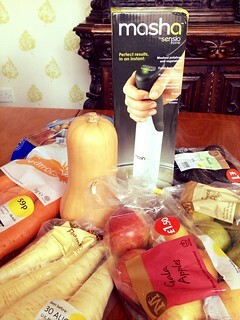 It's fairly quiet and it works very quickly - I dealt with a large saucepan of spuds in five seconds. I even made a video which I'll upload if I can ever get it off my phone. 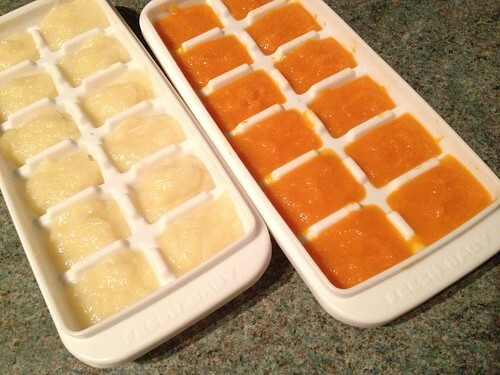 The Masha was equally good with butternut squash, although as the water content is higher, it resulted in more of a puree than mash. With parsnip, I had to be a bit more careful and go over it twice as a few small lumps were left, but that's still only ten seconds to fluffy parsnip mash. So would I recommend the Masha? Yes, it's quick, fairly compact, easy to use and easy to wash up. 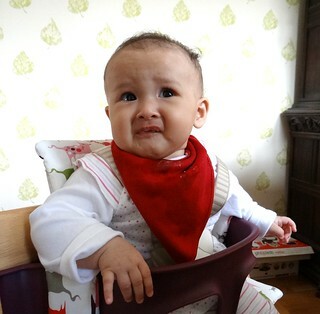 With my almost ten month old still showing no signs of teeth, I think I'll be using this for a good while. And even after her chompers appear, it will still save me time and god knows that's a premium with a baby in the house, but hey, please don't feel like you have to procreate before you can find the thing handy. It makes short work of any veg or fruit (I use it to make guacamole too) and is apparently great for making mayonnaise or whipping cream. You can see the Masha in action and buy one for yourself at The A Range website for £34.99, but you can also win one right here - yes, it's COMPETITION TIME! MPL Home/Sensio is offering a Masha to one Meemalee reader. The prize includes free delivery within the UK in time for Christmas. Entry restricted to readers in the UK. The deadline for entries is 11.59pm GMT Monday 9 December 2013. I reserve the right to alter the closing date of the competition. Changes to the closing date, if they occur, will be shown on this page. The winner will be selected from all valid entries using a random number generator. The prize is offered and provided by MPL Home/Sensio. I accept no responsibility for the acts or defaults of that third party. Entries must provide a valid email address for contacting the winner. The winner will be notified by email or Twitter. If no response is received within 7 days of notification, the prize will be forfeit and a new winner will be picked and contacted. I was sent a review Masha by MPL Home/Sensio. All opinions are my own.